Scalp Acne presents itself in various forms. This paper discusses the more common types: scalp acne, acne militaries and acne necrotica Varioliformis. Acne Keloidalis is another form that affects afro type skin. Also discussing some of the treatments available. You are well advised to seek a professional diagnosis in all types of scalp acne. tends to be classified as a mixed alopecia by some, resulting in permanent hairloss and necrosis. Necrosis is the death or localised destruction of tissue and cells through disease or injury. Acne Necrotica is a chronic relapsing hairloss condition that tends to affect the frontal region. The early stages tend to present as several pustules. Signs of later stages are the presents of irregular scarring that may appear like that of small pox. The etiology in cases of Scalp Acne Necrotica Varioliformis is not fully understood. Some suggest that the appearance of such a condition is a result of an unusual response to staphylococcus Aureus or propinnibacterium acne folliculitis. Others suggest that physical manipulation such as scratching where the underlying skin is affected by folliculitis may be another factor in cases of Varioliformis. Acne Rosacea is another suggested factor. It has been suggested that this hereditary condition may be from which acne necrotica varioliformis originates. The frontal region tend to be most affect in men more so that women. Scalp Acne necrotica varioliformis presents as itchy or in some cases painful elevations which are small and tend to be solid without the present of pus. These papules present a central depression that resemble that of a navel with crusting. The frontal region tends to be most affected. Early stages present small pustules which may be of a reddish brown colour. The follicle in time is destroyed leaving a crusting that is shed weeks later. Scarring may well leave leave visible evidence and disfigurement. A skin biopsy should be sought in order to confirm diagnosis as similarities are seen with many scarring alopecia’s. Early intervention and diagnosis is critical. A scalp biopsy should always be obtained as soon as possible. The following treatments may assist: Oral tetracyclines, and antibacterial shampoos can offer some relief along with sebum secretion inhibitors (isotretinoin) which may lead to prolonged remission. Topical antibiotics may assist. In addition we have a variety of methods to assist the patient. This often to start with will work along side the antibiotics or other medication that you may be using. I would always suggest seeking advice regarding any forms of acne on the scalp as the lasting effects can have devastating consequences. Thank you for reading our site and we hope that you will be in touch soon. Acne Necrotica Miliaris presents itself as small vesicles or pustules, that appear on the scalp region in particular the central and posterior vertices. Scalp Acne is associated with staphylococcus aureus, demodex folliculorum (minute mites that live within the hair follicle) and yeasts of malassez. Irritation may well be present. As the pressure increases within the hair follicle the pustule ruptures resulting in a crust forming over the hair follicle. This may be the only diagnostic feature linking to acne Miliaris. Furthermore, middle aged males and females tend to be affected. Culture may indicate the presence of Corynebacterium (Propioni-bacterium) or Staphylococcus Aureus. 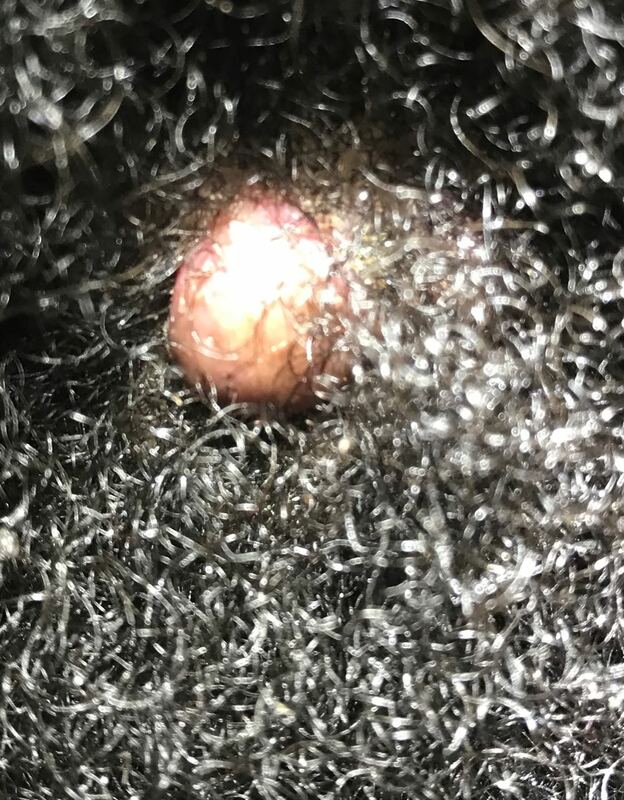 Finally, If this condition is allowed to continue, follicular necrosis (destruction) may occur. Therefore, if you would like to speak with a specialist then please fill in the contact form or give us a call. Many thanks. Acne Keloidalis presents as raised skin forming scar tissue. Furthermore, the hair which grows from this region will be destroyed in most cases. You may find some surviving hairs. It is suggested that acne keloidalis affects mainly young men and will mainly affect the occipital region (the back of the head). The skin is aggravated by a number of factors including, shirt collars, heat, humidity, medication and also the over use of shaving. This in my view would be the reason why this affects afro males over females. Finally, you should in all cases seek professional advise where scalp acne is apparent. Furthermore, do it quickly because the effects can be devastating if not dealt with. Once the acne scarring is present you are limited to what can be done to reverse the process. If you would like to speak with a specialist why not give us a call. It’s free and we may be able to help. We deal with Scalp Acne Necrotica and associated conditions. You can speak with a trichologist on the phone. Just fill in your details on the contact form above or at the bottom of the page and a trichologist will call you shortly. You can of course just give us a ring. Our phone lines do get busy so please leave a message and we will be in touch soon after. Many thanks and perhaps we will speak soon. You are of course welcome to arrange a consultation with a scalp specialist in person. We have dealt with many patients suffering from acne necrotica and other forms of acne over the many years we have been in practice. During the consultation we would examine the scalp and speak with you about your medical history. We are able to offer treatment in many cases assisting the patient to control the condition. Be mindful that acne can scar like the image above shows in the heading. Once the scarring is there you cannot grow the hair back. We hope that you will consider us if choosing a clinic to seek advice from. Many thanks.